This feels a little weird. I’m a novelist (who should probably be working on his latest book) writing a review about a new video game…about a novelist trying to write his latest book but keeps getting distracted by other things. It’s kind of meta, I guess. That’s the correct usage of that word, right? The game is called The Novelist. 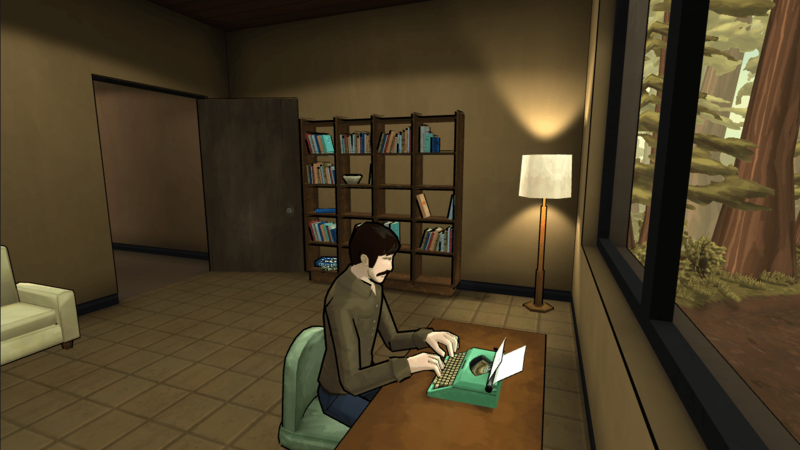 I stumbled across it on Steam a few weeks back and, well, the idea of playing a video game about writing a novel seemed a little odd to me. How on earth did that work? So I decided to pony up the money and, over the past week, I got a chance to play it. The story centers around the titular novelist. His name is Dan Kaplan. He’s recently published his first novel and it’s been moderately successful. Now he has to write his second novel and the pressure is on. In an attempt to finish this new project, he and his family move to a house in a remote forested area for the summer. Dan is hoping that getting away from home will be enough to keep his creative juices flowing so he can produce a great novel. Only that’s going to be difficult, because his wife and kid have their own desires for the summer. Linda, Dan’s wife, has been feeling more and more distant from Dan. She’s hoping that this summer away from home can somehow improve their relationship. She’s also hoping to restart her career as a painter. And Tommy, their son, has his own problems. He’s been struggling in school and probably could use some extra help throughout the summer to get caught up academically and socially. Plus he knows something’s wrong with Daddy and so he wants to be able to help him somehow. 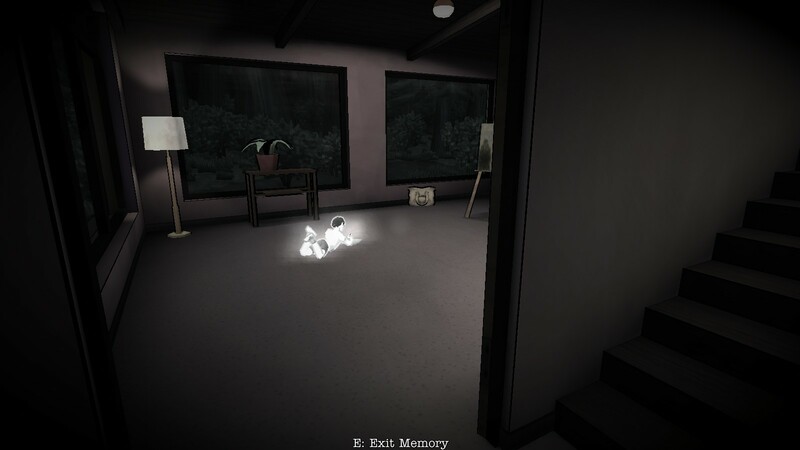 In this game, the player is some sort of ghost or sprite or muse or…sparkling something-or-other who inhabits the house. 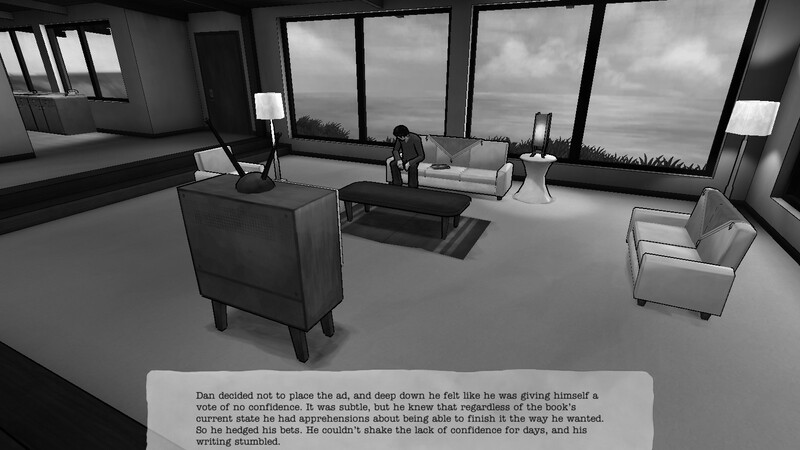 In each section of the game (broken up into chapters), you have to investigate what’s going on in the Kaplans’ lives and see what their desires are. You do this by reading letters that they’re either sending or receiving (or, in the case of Tommy, looking at pictures he’s drawn). You can also read brief snippets of their thoughts or even enter their memories to catch glimpses of what’s been happening. Once you’ve gathered enough information, you can choose whether or not you want to fulfill their wishes or the wishes of one of their family members. For example, in the first chapter, Dan is struggling with writers’ block. He wants to find a notebook that he used to write down an idea to fix his problem. Linda, though, is feeling really disconnected from Dan and is considering divorce. She just wants to spend a night with him, relaxing and drinking a glass of wine. And Tommy, well, he knows that Daddy’s upset about something. Maybe it would help if he and Daddy played a board game. They all can’t get what they want (for the most part). You have to pick: will Dan find his notebook and dive into his writing? Will he spend the evening with Linda? Or will he play the game with Tommy? Now, once you’ve chosen what’s going to happen, you can make a secondary choice, called a “compromise.” In my second playthrough, I had Dan find his notebook, but then, as my compromise, I had him drink a glass of wine with Linda. That helped mitigate her disappointment a little. You keep doing this for week after week until the summer is done. So what will you do? Will you help Dan create a phenomenal literary work that will rock the publishing world? Will you help him salvage his marriage with Linda? Or will you have him focus on getting Tommy the help he needs? You can’t do it all. You have to make a choice. 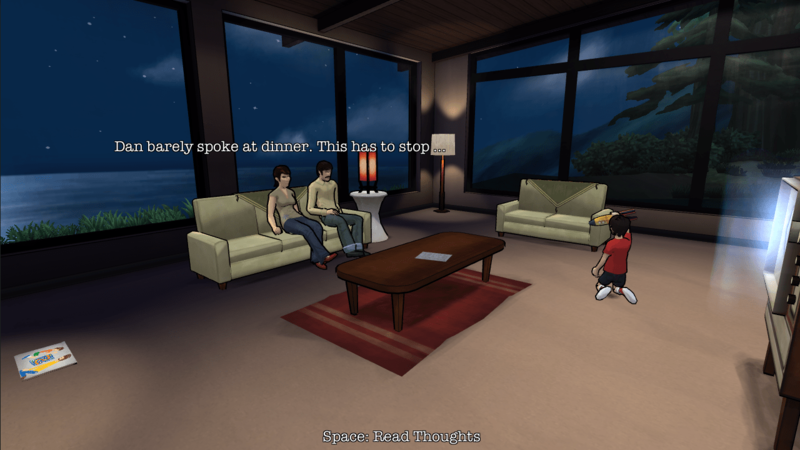 This is an interesting game, although it might be better described as an interactive story with game-like tendencies. As the guiding spirit of the house, you can either be completely invisible to the Kaplans (which is how I played it both times) or you can play in “stealth” mode. When you do that, the Kaplans can spot you if you’re not careful and get freaked out, so you have to hide by possessing light fixtures throughout the house. I tried that once and immediately got caught by Dan and Tommy, so I switched back to the story mode. The choices you face can be heartbreaking, especially when you see the consequences of your choices (I usually got upset when I had to disappoint Tommy somehow). Sometimes, though, the choices seemed a little silly, as if there couldn’t be any middle ground at all. Like in the Writer’s Block chapter I mentioned, I find it hard to believe that Dan couldn’t both find his notebook and have a glass of wine with Linda. He could even spend an afternoon playing a board game with Tommy and still get everything done. Now, not every choice was that trivial and there were some hard decisions to make, but sometimes, they just seemed arbitrary. Make a choice because we tell you you have to make a choice. Unfortunately, the game also suffers a little from shallowness. The Kaplan family are little more than moveable props. While you’re trying to figure out what’s going on, they move around the house and chat with each other, but it doesn’t feel quite real. There’s also another layer to the story that seemed underdeveloped; during the night, you can find journals from previous tenants in the house. Apparently the spirit-whatever-it-is has been influencing people’s choices for years. Those were interesting stories, but they didn’t really contribute much. The final choice you make also seems kind of lopsided as well. In every other chapter, you were presented with three options and you could choose two of them. In the last chapter, you’re given what amounts to two options and you can only choose one. It felt a little off. Now, all that said, I did have fun playing the game. The first time, I made gut level decisions and wound up sacrificing Dan’s writing career for the sake of his wife and kid. The second time, I focused on him getting his book done. I was pleasantly surprised to find that the story changed depending on my previous decisions (but not by much; the chapters just got re-ordered). 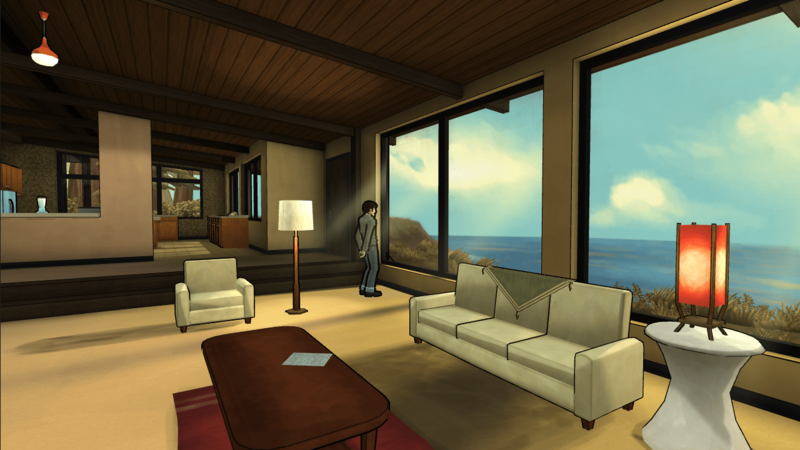 The house’s environment also changes, depending on what choices you’ve made. Take Tommy to the amusement park? Well, then he’s going to decorate the house with drawings of the trip. Help Linda have a successful art show? You’ll find a newspaper clipping about it prominently displayed. And in both playthroughs, the endings were radically different, meaning the game is indeed keeping track of your choices and adjusts it accordingly. All told, this is a fun little “game” and worth checking out. It won’t take you long to play (my second playthrough lasted a little over an hour, mostly because I skipped reading the journals at night). If you’re a writer like me, it’s kind of an amusing distraction.